Cobalt Shock Tower Brace for ND 2016 MX-5 at MossMiata! Our engineering team has done it again. 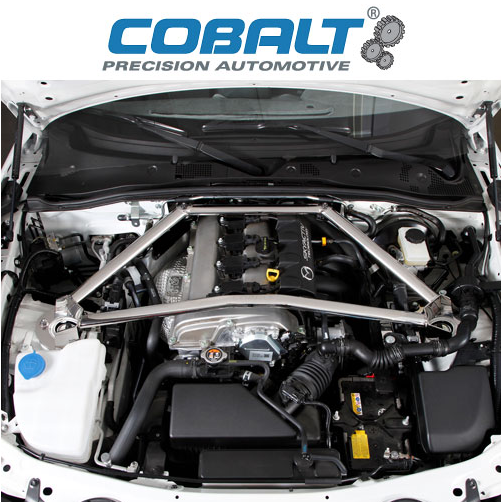 Our widely popular Cobalt brand is meow expanded with the addition of this 3-Point Shock Tower Brace for the newest fourth generation "ND" MX-5 Miata. As soon as our 2016 car was delivered from Mazda our team went to work, and after crucial design time and many testing hours we are proud to bring this bar to market. Don’t bother looking for a strut brace that compares with this one. Oval section stainless steel tubing is mated to beautifully crafted tower supports. The welds on this brace are a work of art! Aside from the best craftsmanship available, this brace actually works. 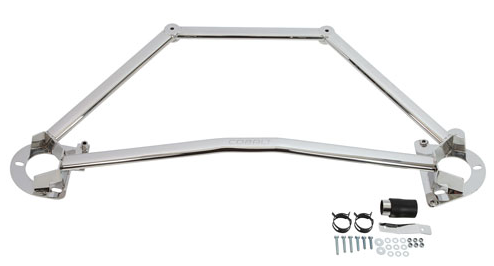 Patterned after Le Mans style chassis bracing, this piece mounts in three places tying the front shocks to the firewall. This ensures rigidity that cannot be duplicated by lesser quality braces that simply mount from shock tower to shock tower. Comes complete with instructions and all necessary hardware.